Gravitate Solutions, the creators of the first-ever association-focused data analytics platform Nucleus, announced today that it has signed a reseller agreement with Higher Logic, the industry leader in cloud-based community platforms. Now with Nucleus, all Higher Logic clients will be able to get a holistic view of their membership engagement metrics when their community data is blended with information from their AMS or another platform. Gravitate Solutions - the creators of the first-ever association-focused data analytics platform Nucleus - announced today that it has signed a reseller agreement with Higher Logic the industry leader in cloud-based community platforms. 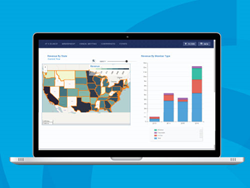 Nucleus is the only data analytics platform that delivers the ability to blend data and create interactive data visualizations across multiple association, corporate and non-profit data sources. This agreement enables Higher Logic to resell Nucleus, blending community activity data with key constituent data to surface critical engagement insights. Nucleus will provide Higher Logic’s clients a simple and intuitive way to blend not only their community metrics and engagement stats, but to overlay it with data from their association’s AMS, LMS, event management system, marketing automation system, Google Analytics, or other systems. The robust blending capabilities will allow associations the opportunity to get a true 360-degree view of their membership engagement seamlessly and intuitively. “Gravitate Solutions is thrilled to work with the stellar team at Higher Logic to support their clients with their data analytics needs. Higher Logic’s community offering and its robust data set were a perfect fit for Nucleus’ data blending capabilities. Now with Nucleus, all Higher Logic clients will be able to get a holistic view of their membership engagement metrics when their community data is blended with information from their AMS or another platform,” said Gravitate Solutions’ Chief Technology Officer Andrew Huling. “We are very excited to be able to offer this data analytics platform to our customers. Engaging members is what Higher Logic is all about, and having a tool to analyze the engagement data we collect with all the other data points an association has on their members will not only allow associations to understand their members, but also allow the association leadership to make strategic, data-driven business decisions,” said Higher Logic’s Director of Partnerships Bobby Kaighn. To see a live demo of Nucleus in action, visit the Higher Logic booth (#401) at the ASAE Annual Meeting & Exposition in Toronto, Canada, August 12-15, 2017 or visit http://www.higherlogic.com/nucleus. For more information, please contact Lindsey Swanson at lswanson(at)gravitatesolutions(dot)com. Gravitate Solutions, is a leading provider of technology solutions to associations, member-based organizations, and nonprofits. Since 2007, Gravitate Solutions has created innovative solutions that address the business challenges unique to its clients. Gravitate’s data scientists have decades of experience in working with member data and are passionate about enabling data-driven insights. The company is headquartered in Alexandria, VA and has offices in Springfield, MO and Chicago, IL. For more information, please visit http://www.gravitatesolutions.com. Higher Logic aims to empower engagement, collaboration and community evolution, which we believe are the fundamental elements to the long-term relevance of any organization. By fostering community growth, you can open up a world of possibility. Tap into the power your community can generate for you.